Download latest Google Apps for Android Phones. Google Apps or GApps are a proprietary core apps set by Google which comes inbuilt in almost all phone and tablets at the time of purchase. They consist of apps like Google Play Store, Gmail, YouTube, Google Maps, Google+, Google Keep, Google Search, Hangouts, Google Photos, Google Drive, Gtalk, Google Calendar, Google Sync, Google Backup, Transport, Car Home, Google Voice, Goggles, Google Contacts, Google Music and much more. These apps are always running in your Android phone under the process of com.google.process.gapps. 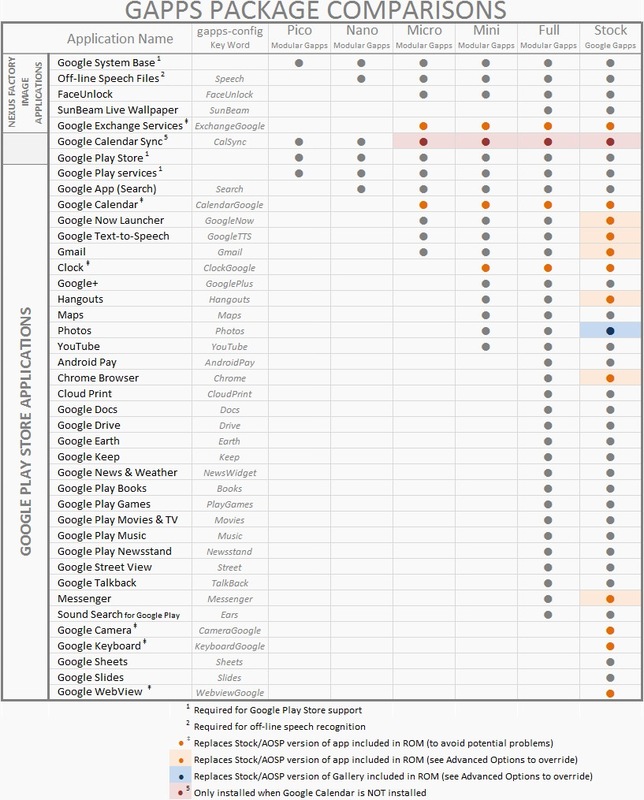 Most of these Google apps can now be easily found and updated via the Google Play Store as well. These apps are not pre-loaded in custom ROM packages since they are officially owned by Google and which will break the licensing restrictions. It is therefore required that you flash them separately. And when it comes to custom ROMs, we can choose which all Google Apps we want depending upon the various GApps packages available out there: aroma, super, stock, full, mini, micro, nano and pico. In order to save your time, we have made a list of all the available versions of Google Apps as per their requisite Android versions. The links are categorized according to Lineage OS / CyanogenMod ROMs but can be used with most of the AOSP based custom ROMs such as, Cyanogenmod, Lineage, Paranoid Android, Resurrection Remix, Slim, Carbon, Mokee etc. Whether it is Android 9 Pie, Android 8.0 Oreo, Android 7.0 Nougat, Android 6.0 Marshmallow, Android 5.0 Lollipop or Android 4.4 KitKat, here you’ll get the latest Google Apps for any Android versions. When installing these Google Apps, make sure that you install the version that matches your Android ROM in order to avoid “com.google.process.gapps has stopped working” type error. For example, if you are running Android 7.0 Nougat, download and install GApps for Nougat. Confirm your Android version from Menu->Apps->Settings->About Phone. Also do not install these Google apps from stock recovery or you might get “signature verification” error. Which GApps Package (ARM, ARM64 or x86) to choose? Check which ARM, ARM64 OR x86 processor your Android phone uses. How to install Google Apps on any Android smartphone. If any of the above links have stopped working or are dead, feel free to contact me through the comments section given below. Subscribe to stay updated!